Sirloin is a very tasty, juicy steak, which is great for barbecuing. Here it is served with salsa verde and a colourful salad of red and yellow tomatoes - a perfect dish for al fresco dining or as part of a barbecue. Score one side of each steak in a criss-cross pattern with a sharp knife, cutting only about one third of the way into the surface. Spread 1 tbsp of the salsa over each scored side. Cook the steaks for 3-5 minutes on each side until cooked to your liking. 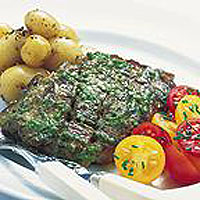 Serve the steaks with an extra spoonful of salsa verde, a salad of red and yellow cherry tomatoes and buttered steamed new potatoes. As a rough guide to cooking steaks, allow 3 minutes cooking each side for rare; 4 minutes each side for medium; 5 minutes each side for well done.